Entertaining Creativity: Rosemary Balsamic Chicken, Ranch Roasted Potatoes and Warm Spinach, Mushroom and Walnut Salad... It's What for Dinner! 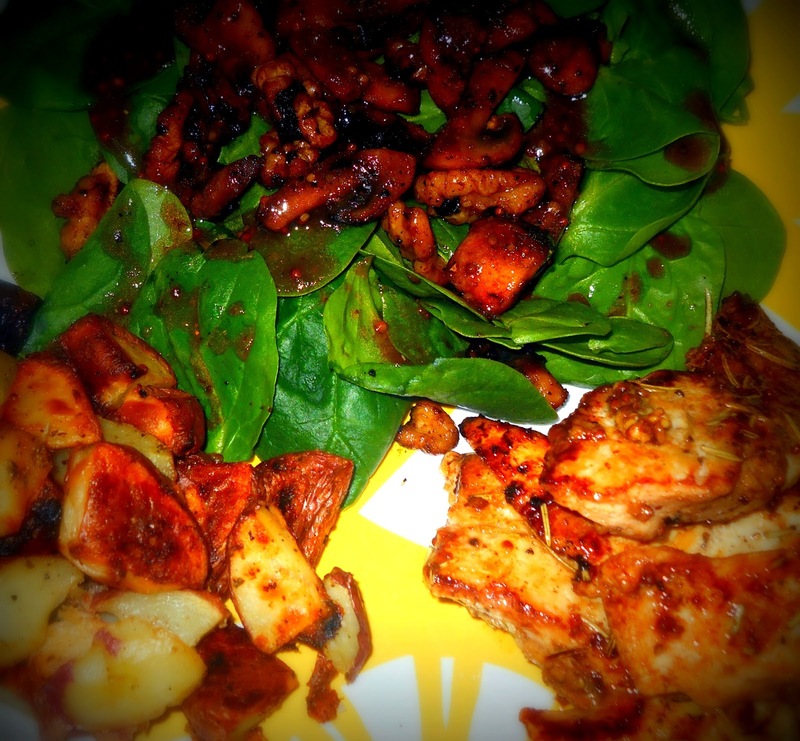 Rosemary Balsamic Chicken, Ranch Roasted Potatoes and Warm Spinach, Mushroom and Walnut Salad... It's What for Dinner! Dinner Time! I got a deal on boneless, skinless chicken breasts this week at the grocery store so I had to come up with some recipes for the chicken that made it taste juicy and yummy and not so blah. This recipe comes from me wanting to just use what I had on hand and I think it turned out really great. Again, praises from the hubby so this one will stay in my recipe box! 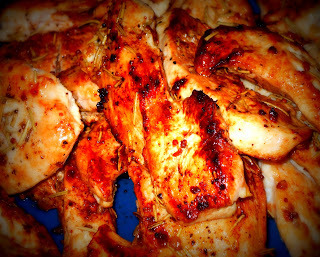 I cut the chicken into about 1 inch strips so they would cook quickly. The second I say that I am going to make dinner my husband somehow thinks that it should be ready about 2 minutes after, so I have to be quick! This is a pretty quick dinner! Heat evoo in a large skillet over med/med-high heat. Season chicken with salt, pepper, rosemary, garlic powder and onion powder. I season all the breasts on one side and then season the other side once I add the chicken to the pan. Brown chicken on one side, about 2-3 minutes and flip. Add the while grain mustard (I add little dollops in the pan in between the areas where the chicken is cooking), add the garlic and do the same thing and then add the balsamic vinegar. Finish until chicken is browned and no longer pink in the center. Heat Oven to 425 degrees. Chop potatoes into bite-size pieces and place in a large ziploc bag, you can use a paper bag here as well. Add evoo or cooking spray (enough to coat all potatoes), Ranch dressing mix, salt and pepper, shake bag to coat evenly. Place on a cookie sheet in an even layer and roast for 25 minutes, checking half way through to mix potatoes and add more cooking spray or evoo if needed so potatoes do not stick to pan. 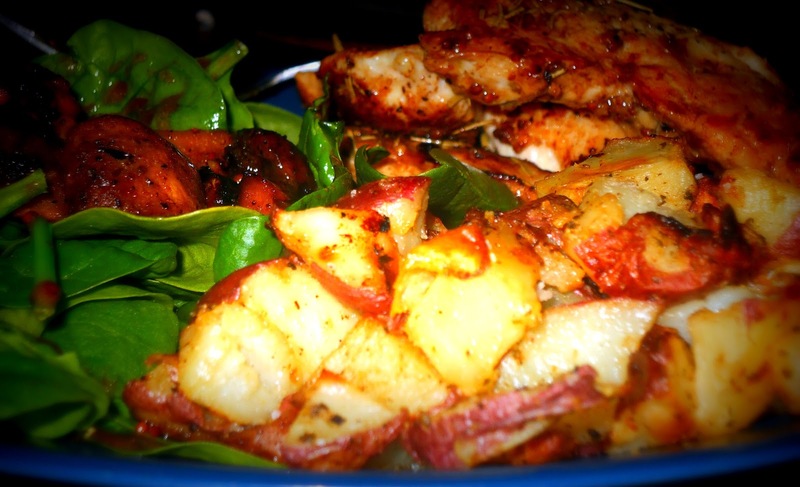 I took this salad to a friends house for dinner and they raved about it! It is so hearty and filling that you could make a meal out of this alone, or just add some cooked chicken to it. Add about 1 TBSP evoo into a skillet on med-high heat, add quartered mushrooms, about 1/2 tsp salt and 1/4 tsp pepper and cook until softened and a bit browned. 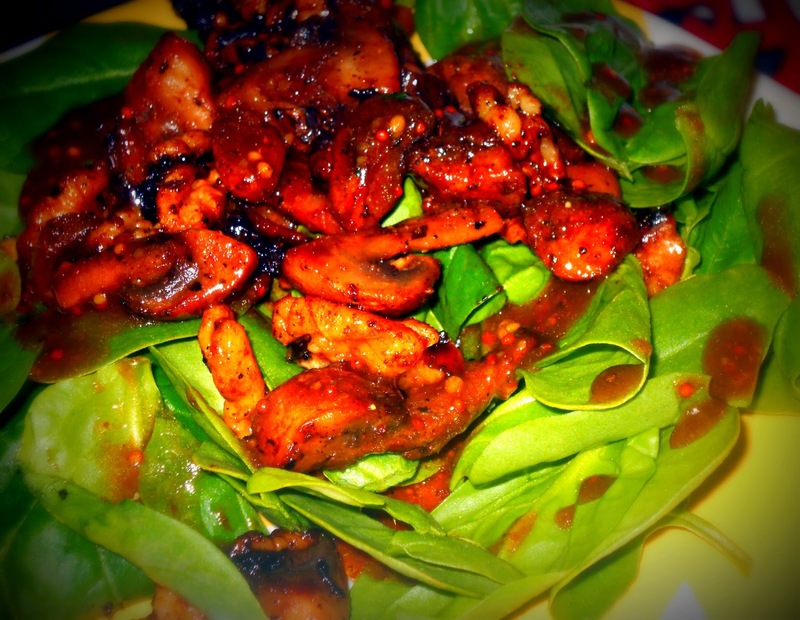 Remove mushrooms from pan, decrease heat to medium and add in walnuts. Toast until you can smell the walnuts, being careful not to burn them and add in mushrooms. 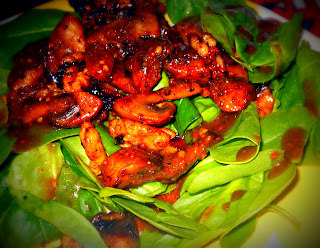 Add honey and balsamic vinegar and cook until there is a coating on the mushrooms and walnuts. I make this dressing to taste, so my measurements aren't exact. Blend all together. You can use a food processor or blender but I just use a bowl and a fork. Works just fine!